All books in the #lovehim series are stand alones. The series number is recommended reading order. Angus Reid is pretty sure he's being catfished. After spending the last half of junior year talking online to the guy of his dreams, Angus wants to meet. In person. So when Scotty brushes it off with excuses of not being ready, red flags go up. Determined to either catch Scotty out, or take a shot at real love, Angus embarks on a summer road trip with his adorkable roommate, Tyler. But as summer stretches on, and mixed messages fly between them, Angus finds his heart torn. Or his straight best friend? And while their road trip takes them across the country, Angus is headed for one destination. Either a happily ever after ... or a broken heart. 5.0 out of 5 starsA journey soon not forgotten. Angus Reid is not your typical high school jock. Yes he plays football, but his out and proud. Everyone at his private bording school adores him, but Angus hasn't found love. Not exactly. This is an epic cross county journey of finding love & what better way to do that then with the people that mean everything. There will be drama, there will be passion, but will his online friend be the man he needs or is Angus indeed being catfished. To be honest, I loved 'To Be Honest'! I could hardly put the book down and read it in a morning and afternoon. The Australian author did a great job with American English, the characters are multi-dimensional, the road trip interesting, and the story telling top-notch. I felt like I was right there with the guys as this first person present tense story progressed. The story engaged me so thoroughly that I didn't even realize it was written in present tense until I was halfway through it. Elements of the short messaging segments hit very close to home with me. Except for a couple of reasons, I would have given 'To Be Honest' five stars. 1. The book isn't formatted correctly. If an author isn't going to indent each paragraph, I think there ought to be a blank line between them. This just makes for easier reading. 2. This might really seem like nitpicking to some, but the word is spelled 'whoa' not 'woah'. I can't see how a proofer could miss this several times throughout the book. Even computer proofing ought to catch this one. Are these reason enough to pass on this book? Absolutely not! Although this book is about teenagers, I think it might appeal to a much broader audience. Two thumbs up from me! From the start I had this feeling Tyler was Scotty, but then Angus got messages while they were roadtripping and in my mind it didn't add up. I love the reason why Tyler acted like he did. He had some very serious reasons to do so. And cheers for the football team for being great guys. What an amazing journey of discovery and love. You travel with people that have lots going on in their lives which makes it a wild ride and worth the read. 5.0 out of 5 starsAmazing coming of age story! Loved it so much!! Another wonderful coming of age story by S.M. James. I love how authentic and well-rounded her characters are. Angus, Tyler, Anah and even Link are not “too wise for their age” mini-adults, but genuine young people trying to figure out who they are and what they want their future to be like. I had the hardest time not skipping ahead to the end to see what the deal was with Scotty. But I refrained and read the book from beginning to end, no peeking, like the grown-up that I am. Go me! Scotty remains a mystery for most of the story, but looking for clues to find out more about him was super fun. This book has an amazing cast of characters apart from Angus. I adored Tyler in all his nerdiness and I loved how well he and Angus click as friends. Anah is Angus’s other amazing friend, who has some romantic issues of her own to deal with along the way. She’s feisty and loyal, and her friendship really makes a difference for Angus. She’s the best! This is a very enjoyable read and you might think it’s just another lighthearted, feel-good story about friendship , acceptance and love. An exciting road trip, destination: Angus’s happy ending. And that would have been pretty great already… But there’s more to this book than that. Some really touching moments come along to make you blink away a tear or smile softly to yourself, and unexpectedly some ugly reality also sneaks in… and you realize society still has a way to go with regards to homophobia (internalized or otherwise). This is a story to make you think, even as it brings you hope and gives you all the feels!! The ending was amazing! It all worked out so beautifully, with "he who shall remain nameless" pulling out all the stops to get his man. Swoon! The switch in pov at the end was great! I was so happy to finally get a glimpse from his perspective, whereas before we only see through Angus's eyes. Rating: 4.5 stars out of 5Angus Reid is pretty sure he's being catfished.After spending the last half of junior year talking online to the guy of his dreams, Angus wants to meet. In person. So when Scotty brushes it off with excuses of not being ready, red flags go up.Determined to either catch Scotty out, or take a shot at real love, Angus embarks on a summer road trip with his adorkable roommate, Tyler. 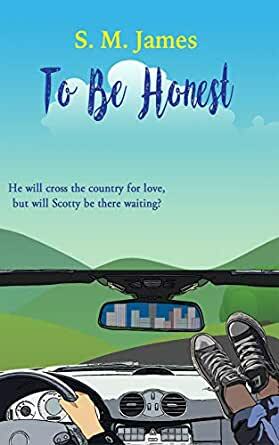 But as summer stretches on, and mixed messages fly between them, Angus finds his heart torn.His potential catfisher?Or his straight best friend?And while their road trip takes them across the country, Angus is headed for one destination.Either a happily ever after ... or a broken heart.Continuing that outstanding YA series #lovehim is To Be Honest (#lovehim #2) by S.M. James. To be all fangyrl here, I heart them so much.Angus Reid was mentioned in the first story, That Feeling When, as the only out person that Archie Corrigan knew at the boarding school they both went too. Angus is well liked,popular with every crowd and clique, masculine yet "gay" within Archie's definitions at that time. And it just added to Archie's confusion. Angus seemed to be everything Archie was not. And yes, Archie makes a couple of appearances here.True to form and the writing of this amazing author, we find out that what you see is not what is laying deep underneath the surface. Especially with teenagers.I have never been much for YA stories until the last couple of years or so then a splendid number of just beautifully written coming of age, coming out stories brought me firmly back to this genre. It takes such skill to bring out the hormonal, on the edge of....something..., the need to be more, to know more, part bravery, part fear and ignorance...it's such a trying time to be a young human. Being LGBT even more so. What a road of self discovery lies ahead. S.M. James has proven themselves a master at giving their readers deeply layered characters at that crucial stage of development and then pushing them off onto the path or in this case road of self discovery and love.Angus and friend/roommate, Tyler, are poised on the brink of changes in their lives as their junior year is ending and summer approaches. Angus will be moving into his own room at school as a senior, leaving Tyler behind, a profound change in their relationship neither has addressed. Angus' other bbf has broken up with her boyfriend again, seemingly for the last time, although Angus has his doubts. And the person he has been chatting with online and wants to meet, won't commit to meeting him. Everything is topsy turvey....emotionally and mentally.The story rolls out through the points of view of Angus, as well as the texts between himself and Scotty, his online infatuation/love.James makes Angus and Tyler so real, along with everything each of them is going through personally. I felt as though I knew them both. And that road trip that they take (the Maryland Hospitality House I can vouch for) turns out to be not only a moving journey of self discovery but a great sightseeing tour of several states and locations. Trust me I will never think of envelopes of dirt without wanting to add a sniffle or two. The journey ends up profoundly changing both Angus, Tyler, and the readers.The question of course as to who Scotty is will be quickly answered by most of you. No, it was how everything was going to play out, what was going to be the overall picture here. What happens, not only to Angus and Tyler but to several others in the picture as well.S.M. James pulls you into life at this school and the young people living there. It's the Community Boards that pop up and the people that use them. It's the entire universe this author is creating and then populating that has me addicted.I still have a couple of books to go. But those that i have read? I highly recommend them all. They are moving, gorgeously written, and tremendous characters and great plots. Pick them all up today.Cover art is amazing. Bright and perfect down to the sneakers propped up on the dashboard as the car goes down the road.